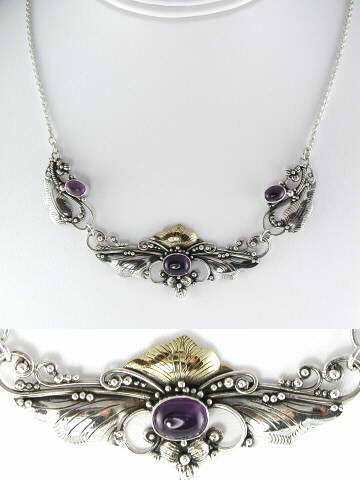 Beautiful 925 sterling silver, scrollwork necklace in three sections, set with three, deep violet, Amethyst cabochons. The craftsmanship is exceptional with beautiful attention to detail. An enlargement of the main centre section is shown at the bottom of the picture, showing the gilt finish to the top leaf moulding.